Peach gnocchi: peach velouté, peach sorbet, tamarind paste. 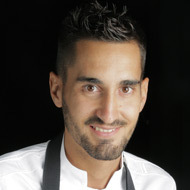 If the concept of sweet cuisine could be personalized in a particular pastry chef, this could well be Rafa Delgado. 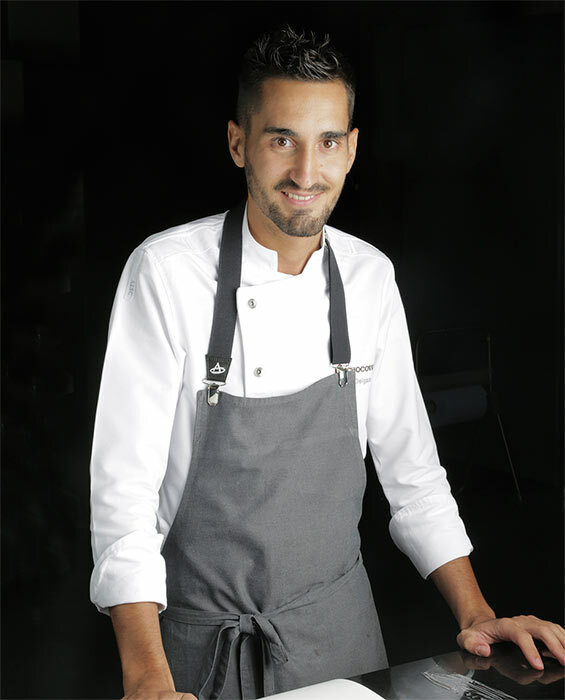 Perhaps this has to do with his also savory training and his passage through Mugaritz, elBulli, Alkimia or his current activity in Can Jubany. 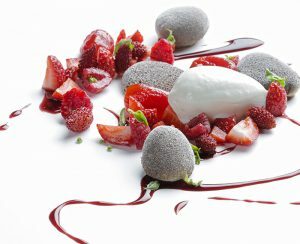 His desserts are fresh and ephemeral, cooked for the client as immediately as possible. He does not manufacture and freeze elements that are then unmolded and placed on a plate in a serialized way, but conceives the dessert as a whole that is cooked, sautéed, plated, and salted as if it were a unique work of art. There is a controlled anarchy in all of this that leads to a very personal ending, and a game that provokes the reaction of the diner. It’s a chutney that ends up being a mango-toffee-ginger risotto; a peach in syrup that turns into gnocchi, and a rocky panacotta landscape, tomato comfit and balsamic cream, three creations that Rafa Delgado offers us exclusively in these pages. ‘I do not use trendy techniques for personal display if it is not reflected positively on the plate and if they do not respect the product,’ he says. 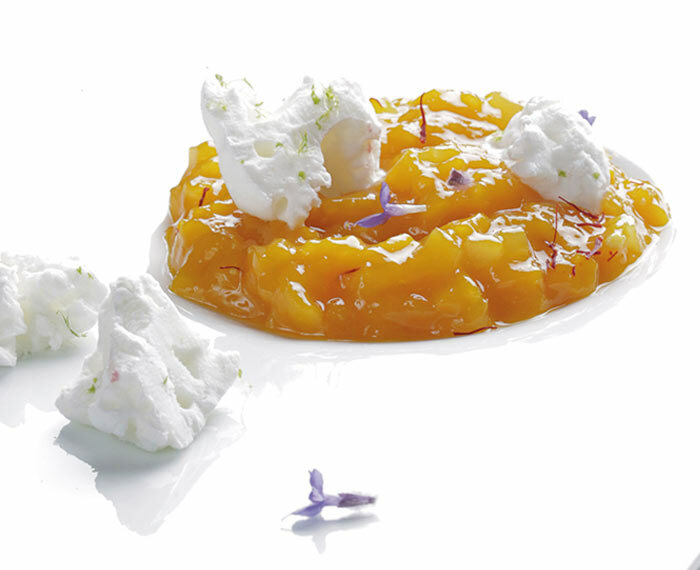 ‘It is like ratcheting up the typical peach in syrup. 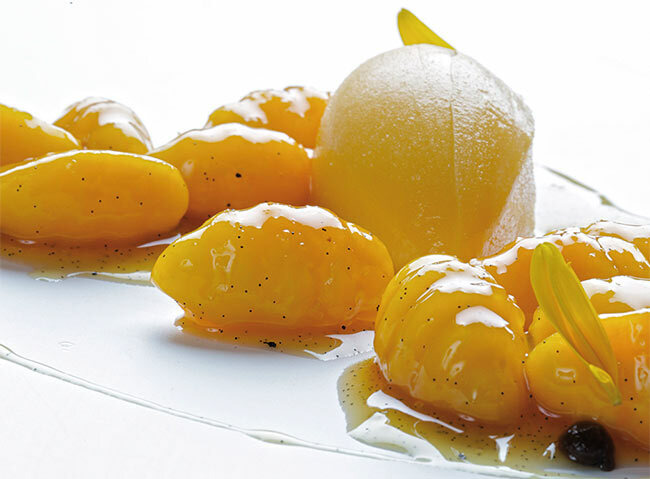 Cutting the peach by using a potato baller and the nappage in its own juice create a visual effect resembling peach gnocchi. 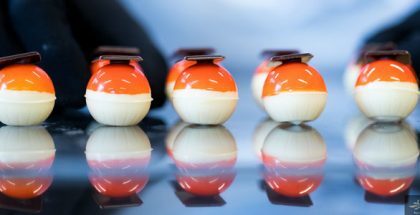 It is the synergy between the sweet and savory worlds both regarding the aesthetics and the techniques. With the help of a baller, make gnocchi with the peach. Caramelize the sugar and add the peach. Sauté and deglaze with the peach liqueur. Cover completely with water, add some tablespoons of sugar (depending on the sweetness of the peaches, add more or less sugar) and the scraped vanilla. Reserve in the refrigerator for 4 hours. Dissolve the corn starch in the cold liquid and bring to a boil. Strain and reserve covered with plastic wrap in the refrigerator. 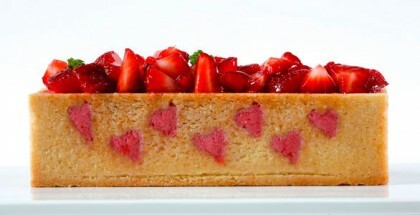 Make a syrup with the water and sugar and, once cool, mix with the remaining ingredients in the container of a Pacojet. Freeze. Make a tamarind paste sifted with the help of some hot water. Once cooled, transfer to a pastry bag and reserve.